I’ve been to a SugarFish location before; I visited the Marina Del Rey location soon after it opened a couple years back. I left unimpressed. I thought the fish was pretty good, but I was restrained by three “Trust Me” fixed menus that included tuna cut rolls and cucumber cut rolls (something I often perceive as a ‘filler’) and no way to order extra food a la carte. I remember leaving hungry after eating the fixed menu, and not being able to order more food (outside of another fixed menu). I’m told all of those issues have long since been remediated, and it showed at the downtown location. 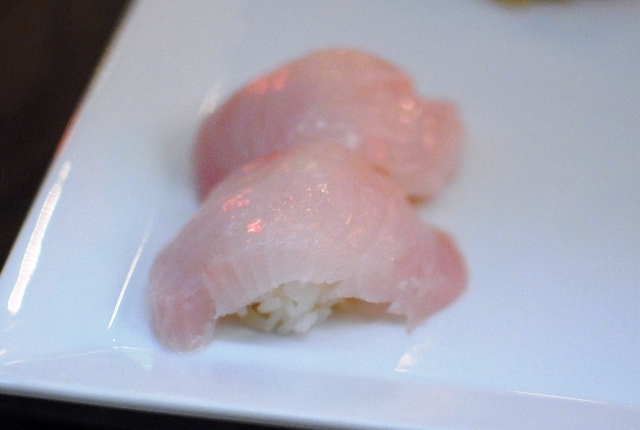 The fixed menus, which frequently change, features an attractive lineup of nigiri and hand or cut rolls – no more cucumber rolls (though, it is available a la carte). 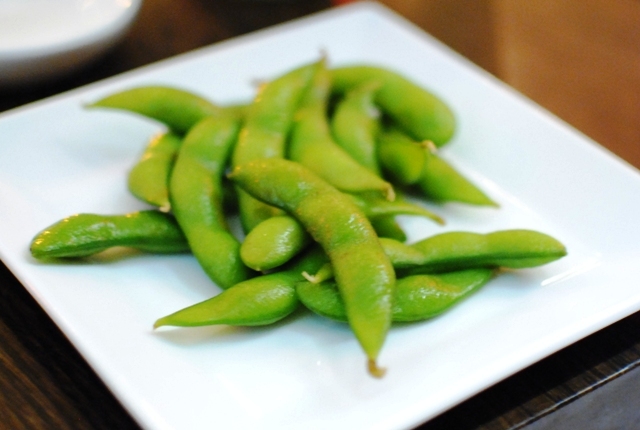 If a custom menu is preferable, all of the sushi is offered a la carte as well. We started with a plate of edamame served at room temperature and lightly salted. This was the first fish course, featuring some vibrant colors. The fish was tender and delicious, and the green onions added some nice flavor and texture. This was my first bite of sushi, and it was actually my best. The fish melted in my mouth as it was so tender. The house ponzo added just a little more depth of flavor to this already-delicious bite. 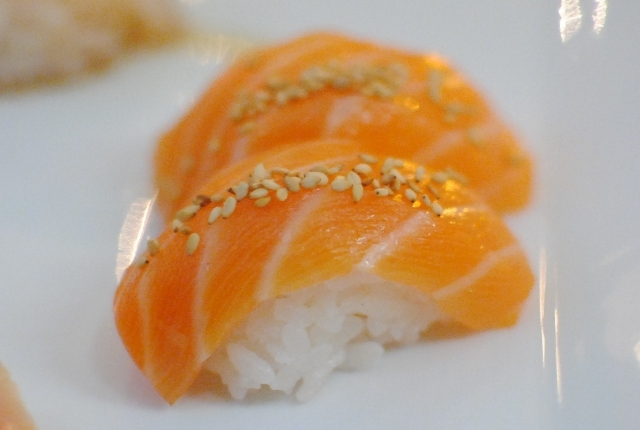 I enjoyed the sesame topping, as it added a little nuttiness to this sushi. The salmon was good. This snapper featured a chili ponzu. 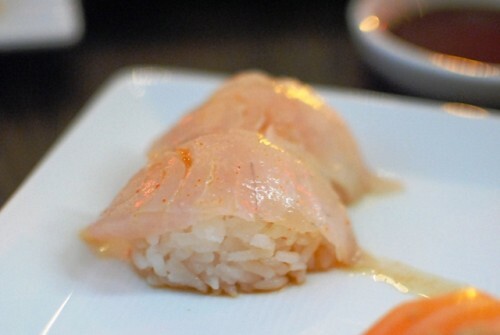 Another tender piece of fish was heightened by a little bit of heat from the chili ponzu. 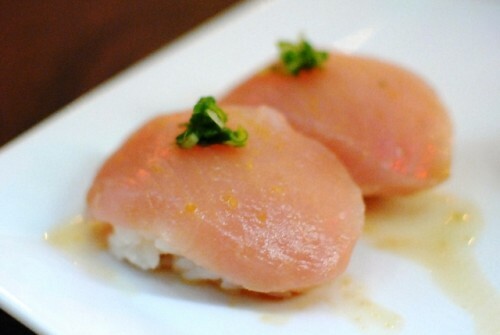 The yellowtail had a mild flavor, but was silky smooth. Teeth not necessary. 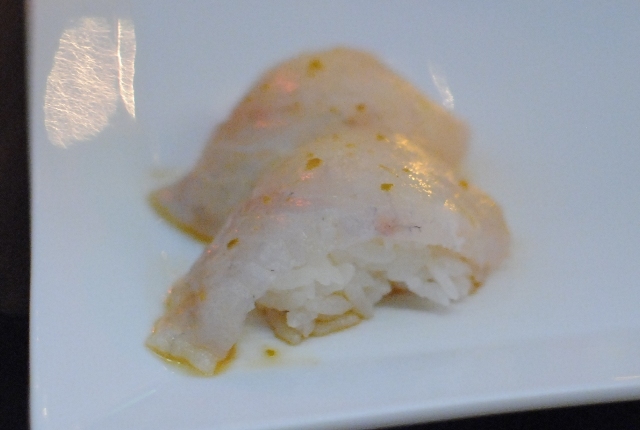 This halibut was topped with yuzu rind, which imparted some nice citrus. Fish is almost always better with citrus tones, and this was a clear example of that. We next got into the hand rolls. We were instructed to eat these as soon as impossible to avoid the seaweed from getting soggy. The components that struck me first were the crisp seaweed wrapper and warm rice. Very nice. The toro was good as well. 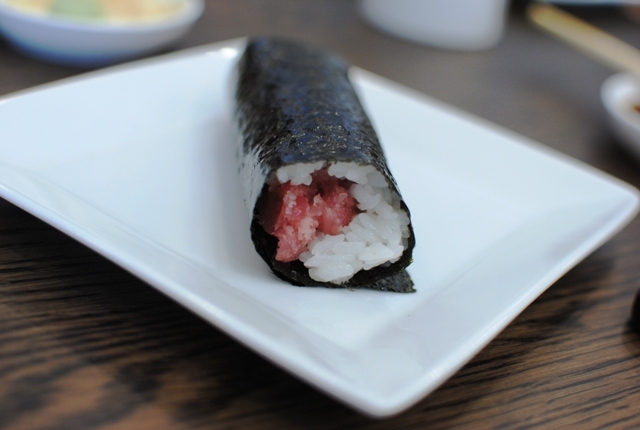 Next was this hand roll featuring blue crab. 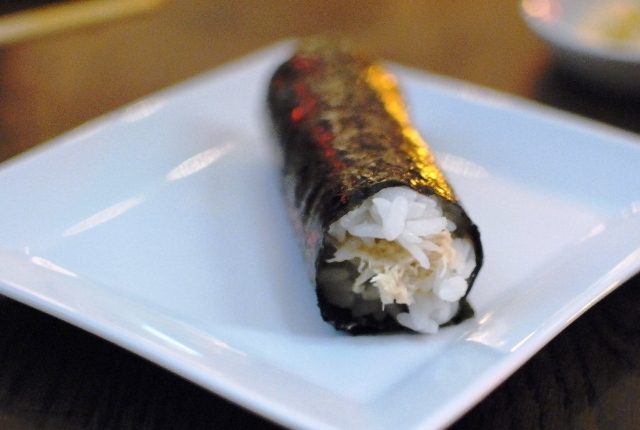 The cool, sweet crab was surrounded by warm rice and seaweed, making these some tasty bites. 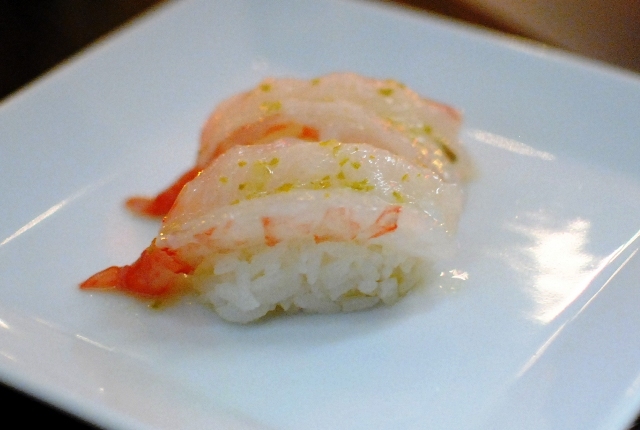 The daily special on this day was sweet shrimp…happens to be one of my favorite! I loved the fresh shrimp for its sweetness and delicate mouthfeel. This concluded our fixed menu, but we ordered a couple of things off the a la carte menu. The waitress strongly recommended these, and they didn’t disappoint. 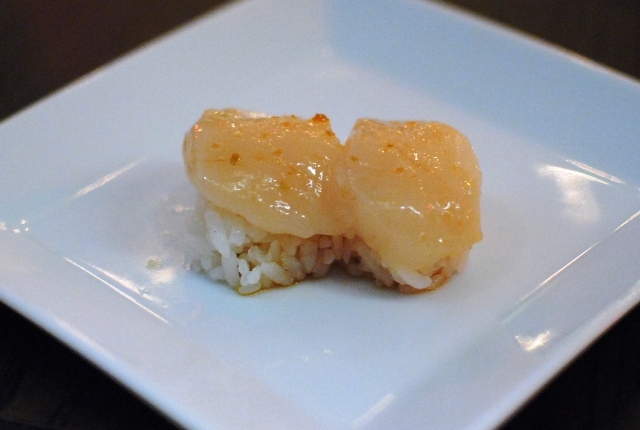 A yuzu ponzu topped these scallops, which were tender and flavorful. I found the rice to be too loosely packed on these pieces, however, as the rice broke apart just as I picked it up. Definitely a no-no. Lastly, we tried this Catalina Island uni. 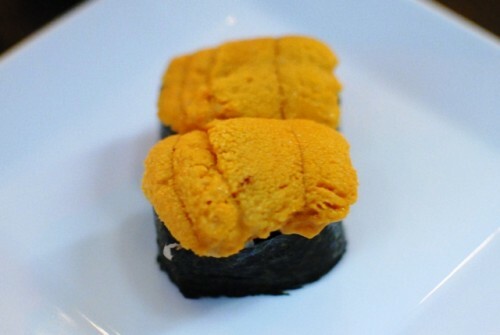 I always see Santa Barbara uni, so it was interesting to see Nozawa prefers this variety. Something about the kelp that the uni eat in the area, apparently. Cool and refreshing, this was a very strong display of uni…not fishy at all. I can’t say I could choose this over Santa Barbara uni – they’re both excellent. This was a good amount of food; I was actually content after the fixed menu finished. I have to say I was pretty impressed by this meal, even the service was notably strong. My dining companion would attest to the fact that I kept talking about this meal throughout the night…after we left the restaurant. Part of it may be due to the less-than-steller experience I had last time a while back (lowering expectations), but the fish was fresh and had good, clean flavors. At relatively reasonable prices (the Nozawa is the most expensive fixed meal at $38), I expect Sugarfish Downtown to become quite popular. And soon. Beautiful. I like your Sugarfish pics the most! that mountain of uni looks soooooooooooooooo amazing! I KNOW! Love that uni picture, if I do say so myself! I was lucky enough to get a seat closer to the sushi bar..giving me a little bit more light. I love your blog! I live in LA and I’ve been meaning to try a few of the places you’ve blogged about. 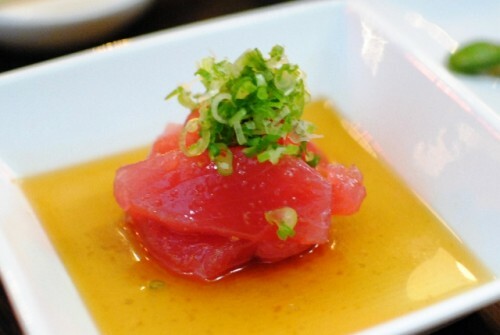 SugarFish is definitely on my list. Really great pictures too, by the way! Thanks Sarah! 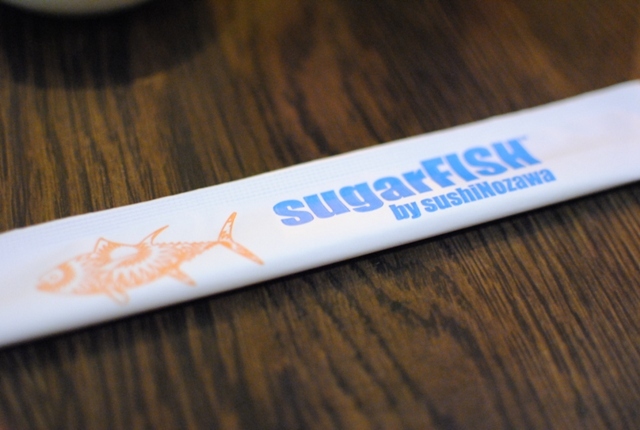 For sure visit Sugarfish when you get a chance!